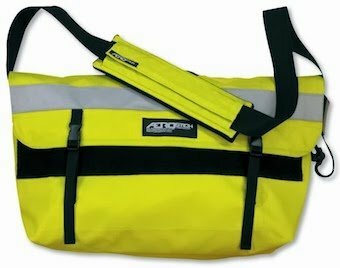 For about a month now I have been using an Aerostich Courier bag when commuting to work on my 2007 Suzuki V-Strom 650 and my 2012 Suzuki GSX-R750. As you can imagine, the body position is rather different between these two bikes. The V-Strom has an upright, neutral position and the Gixxer has me leaning forward with my elbows practically touching my knees. I use the Courier bag to carry my lunch, an iPad, an external hard drive, and a few other miscellaneous items. The total weight is around six pounds. The bag itself is one large compartment. I purchased the additional pocket organizer that attaches to the inside panel (that presses against my back) with hook-and-loop fasteners. In this I store pens, business cards, a small notebook, and a few other small miscellaneous items. I switched from using a Targus backpack with traditional shoulder straps and several external pockets, and so far I think I like the one big compartment of the Courier bag much better. It’s faster to get stuff in and out of the courier bag, and of course it’s easier to see in a single glance what is inside. My biggest concern was switching from shoulder straps (plural) to a singular over-the-shoulder strap. Once the bag is slung over my head to the opposite shoulder, it presses against the flat of my back and I don’t notice it anymore after I get on the bike. Even when leaning forward on my Gixxer, the courier bag is comfortable and stable. The hook-and-loop panel holding the main flap down is very wide and opening it can be rather loud. I commuted to work through some serious rain the other day on my V-Strom while wearing my Aerostich Courier bag slung over my Roadcrafter one-piece suit. The bag remained stable and the contents were kept completely dry despite the heavy precipitation. I’m sold on the quality of this bag and wish I had purchased it long ago. The craftsmanship of this bag is outstanding, just like that of my Darien jacket and Roadcrafter one-piece suit. The materials are solid and I can tell this bag is going to last me a very long time. Considering the very low price, I think it is an outstanding value. Sometimes you ride your bike for the sole purpose of getting it ridden. I doubt that’s proper grammar, but at least I didn’t end the sentence with a preposition. (Every time you do that a puppy dies.) This time of year, opportunities to go for a 150 mile day ride are few and far between. The bulk of my rides are commutes to work and back. Sunday I rode into Gresham and back, in the rain, simply to ride the bike. This is to keep things moving and keep the battery charged. I rode to work today as well, being one of the only semi-dry days forecasted for the entire week. Sometimes you ride simply to get the bike ridden. Today is the annual Ride to Work Day. The third Monday of every June has been set aside to highlight the value and benefits of riding a motorcycle or scooter to work. The day is also intended to get those driving cars and trucks to become aware of motorcycles, to see them, and to share the road safely and courteously with them. I rode to work today. I had two different vehicles pull out in front of me, even though both looked directly at me. That’s why I ride as if I’m invisible (sometimes I think I really am). I assume motorists don’t see me or even recognize my existence or at the very least my right to exist. Ultimately my safety is my own responsibility so I ride accordingly. If you drive a car, be aware that motorcycles are out there sharing the road. Look for them, and give them the same respect and courtesy on the road that you’d expect others to give to you. Let’s all get to our destinations safely.